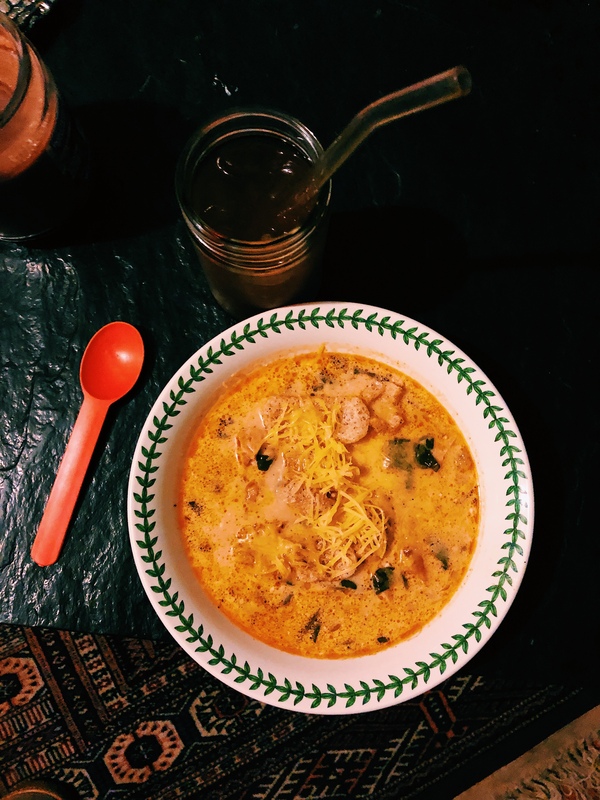 This soup is a little creamy, a little spicy, and oh so yummy for a cold night. If you’re not in the mood to cook up the chicken you could always use a *rotisserie chicken and that would save you some time. Spread Avocado Oil into Pyrex Casserole Dish. Place Chicken Thighs onto oiled casserole dish and season with Salt and Pepper. Bake for 25-35 Minutes. Add Bacon Fat and Onions to a Large Pot. Sauté on medium heat until Onions are Opaque. Add some Salt and Pepper. Add Garlic and Chile’s. Sauté for a 7 minutes. Stirring regularly so Garlic doesn’t burn. Add Chicken Broth, Cumin, Smoked Paprika, Salt and Pepper. Add Zucchini and Spinach. Turn down temperature to low/medium. Check on Chicken in oven. When juices run clear, chop chicken into cubes. Set Aside. Add Heavy Whipping Cream, Cream Cheese and Chicken cubes. Stir well to break up Cream Cheese. Taste add any additional Salt and Pepper. Before serving Garnish with Grated Cheese and Some Chicharrones.